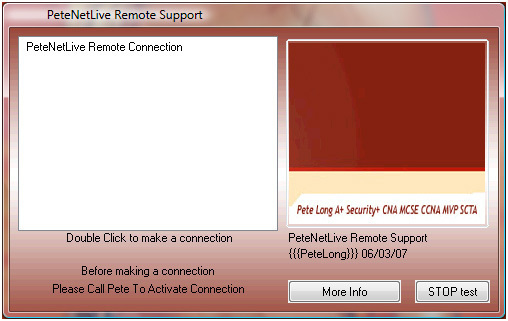 If you need to remote a distant PC, either for work purposes or you have a friend or relative who is technically challenged. Or you simply would like to be able to get back to watching TV, or having a life quicker, you would rather “Fix” it yourself than talking a frightened technophobe though the registry etc. Then UltraVNC SC is the tool you need. Normally using VNC you would need to talk the person at the other end through downloading a version of VNC installing it, finding out their IP address etc before you could even start to help, if like me you have no patience at all, then removing all these steps is much quicker. If you are unfamiliar with VNC products, you install the software on the “Controlled” end in server mode which “Listens” for connections and you install the software on the “Controlling” end in viewer mode and point it to the target. This is all well and good but what if you want the other end to request a remote control session without needing to install or configure anything so you can get on quickly and get back doing something more interesting like watching 24 or drinking Vodka. 2. You need to have TCP port 5500 open to your PC/Server – so you will need to do some port forwarding and if you have a firewall allow traffic in on this port. 4. You will also see helpdesk.txt this is the configuration file used to create the .exe file. 5. Edit the files as appropirate the icons are 32×32 and keep the bitmaps below 256 colour . 6. Here Is what Im going to use. 7. Here is the helpdesk.txt file I’m going to use. 10.Log in username:foo Password:foobar Upload file: Navigate to the zip file with all your icons and bitmaps in (change the name of custom.zip whatever you call the zip file the executable will be called). 12. Download the Executable it creates for you. 2.Launch the Installer > English > OK > Next > I Accept > Next > Next > Next > Next > Next > Next > Install > Continue Anyway > Next > Finish. 4.Send the executable you created earlier to the person at the other end and get them to run it. 5.When they open the connection your PC will ask you if you want to allow the connection > Click Yes. 11. Click Upload 12. Download the Executable it creates for you.